"If only I could go back and do everything differently." Netflix has debuted a trailer for a romantic comedy of sorts titled When We First Met, from filmmaker Ari Sandel. The time loop comedy is about a guy who goes on the best first date with a girl, only to end up in the friend zone. Three years later he discovers he can go back in time (thanks to a photo booth), and tries to figure out how to get it right and get the girl. But will it work? Adam Devine stars as the guy, and Alexandra Daddario as the girl. Even though this is another play on time loop comedies, it still looks hilarious. The cast includes Shelley Hennig, Andrew Bachelor, Noureen DeWulf, and Robbie Amell. This kind of came out of nowhere, but I'm curious to check it out. Noah (Adam Devine) spends the perfect first night with Avery (Alexandra Daddario), the girl of his dreams, but gets relegated to the friend zone. He spends the next three years wondering what went wrong - until he gets the unexpected chance to travel back in time and alter that night - and his fate - over and over again. Will Noah ever get it right? 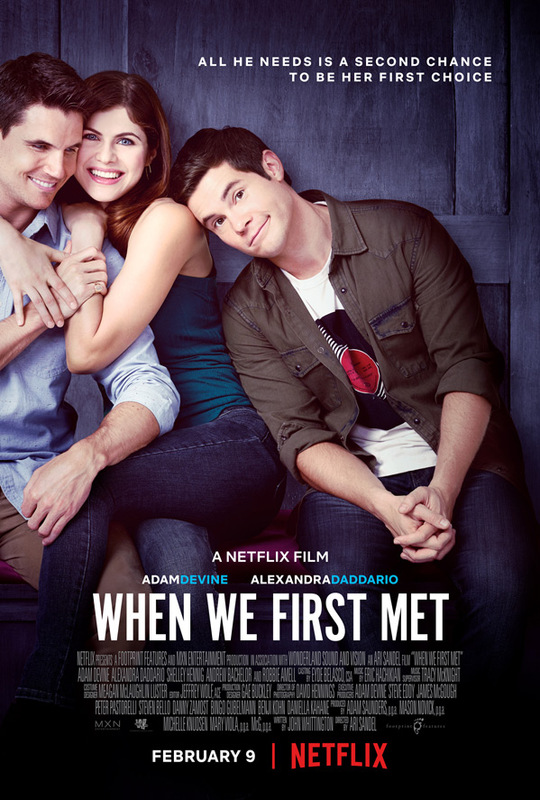 When We First Met is directed by American comedy filmmaker Ari Sandel, of the film The DUFF previously and a few other short films. The screenplay is written by John Whittington. Netflix will release Sandel's When We First Met streaming exclusively starting February 9th.